Deliver me from the demons of tentative baking! This bad boy is an experiment. I needed to make bread, but didn't have the three hours it usually takes for all the waiting. I usually go to Peter Reinhart when it's time to try something new. His recipes are pretty much my zone since he personally trained me to bake some damn fine bread. (Through his writing, of course). So I checked out a Biga recipe which is basically half a loaf of bread which you let sit to ferment in the fridge. I can leave the house that way and don't have to worry about over rising. But I wanted to use some of the baking materials I got from the Amish in fall and I wanted to make a wheat bread with the bran and oats on top and everything. So I pulled out the Biga recipe and started to cogitatin'. 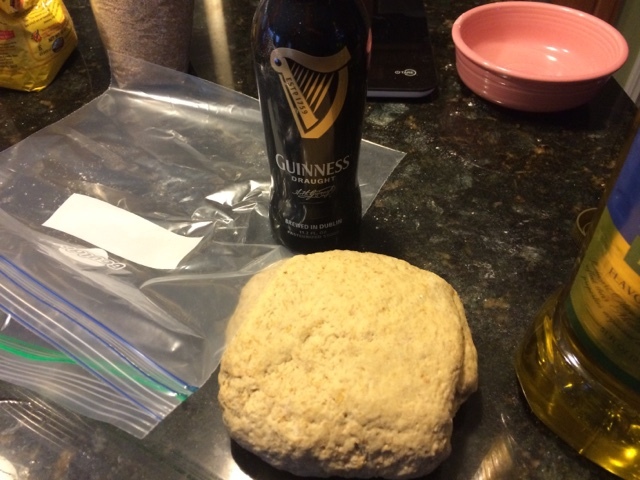 Using bread hook, mix in Guinness until a stiff ball forms. At this point you can knead with the bread hook or just knead by hand for 5-10 minutes. The dough ball should be ever so slightly sticky and you can always knead in more flour if it's too wet. Put that in a plastic zipper bag with 1T olive oil smoothed around inside the bag to lubricate. Then go shopping. When you et home your Biga should be about 2X the size and soft. You can use this in bread now.